Once the project was over, Katie Buri was furious at seeing Thailand’s wildlife heritage being crated and shipped out of the country. Katie was a force to be feared when she got mad. She knew Kukrit Pramoj, and she called me one day asking me to go to a copy shop and make copies of all the reports for her—which, of course, I did. Soon afterwards, Thailand banned the export of all primates and most mammals. Last week I told you about the collection of primate postage stamps recently donated to IPPL by our late member David Rand of Berkeley, California. That got me thinking about the time when I initially met David, a man who had a passion for primates and travel, as I did. It was when I was living in Bangkok, Thailand, in the early days of IPPL—around the time of IPPL’s Project Bangkok Airport. I lived in Bangkok, Thailand, from 1971 to 1975. 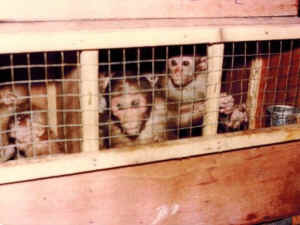 In 1971, while collecting my cargo, I saw several crates of monkeys awaiting shipment overseas and became interested in primates. 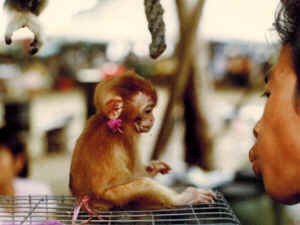 I saw abused primates at so many places around Thailand: on beaches, in bars, in shoddy zoos, and being kept as pets. But the terrified look on the faces of those monkeys being exported haunted me. I decided I wanted to stop this trade, and I had just founded IPPL, in 1973. But how could I, as a foreigner (“farang”) do anything? My close friend Katherine Buri, a Thai national, was supportive of my dream. This happened to be a time of democracy in Thailand. Student-driven campaigns had led to the overthrow of the military government. Democratically-elected Kukrit Pramoj was Prime Minister. Change was in the air! Then an idea hit me: why not put “student power” to work to help Thailand’s animals? The students’ long break was coming up. I had met some students at a nature club meeting and got in touch with them to ask if they would like to work as student observers for the summer at Bangkok Airport. To my surprise, it was fairly easy to raise funds for this. Besides Katherine Buri, Christine Stevens of the Animal Welfare Institute, the Fauna Preservation Society, the International (now World) Society for the Protection of Animals, and the New York Zoological Society financed the project. Project Bangkok Airport began on March 31, 1975, and continued until June 6. There were teams of students from Chulalongkorn, Mahidol, and Kasetsart Universities. The students recorded over 100,000 animals leaving Thailand and logged each shipment for compliance with animal shipping standards established by the International Air Transport Association. They made many significant observations. They saw that the crates were brutally tossed around by animal handlers. Sometimes children hanging around the airport (known as “airport urchins”) sat on crates kicking at the sides. When there were water pots, they were usually empty. Feeding instructions were ignored. Most crates had insufficient ventilation. This was because many animals were shipped in snake boxes pierced with such tiny holes that made it impossible to see what was really inside. No Thai officials inspected these crates. Any crate labeled “Spitting Cobras” was 100% certain not to be inspected! The dealers may put something else such as gibbon into poison snake boxes, because no one opens them to see. It will be good if the airline companies would refuse to carry any animal containers not in standard with the IATA rules. Sometimes the dealers may change the animals inside the cages after check by Forestry men, because they checked the cages in the afternoon, but they were carried into the planes at nights…. They observed one shipment of monkeys on the way to Primate Imports of New York. The 25 animals were jammed into two crates: five adolescents, 12 juveniles, and eight tiny infants were observed, all under extreme stress. The students actually caught one smuggler who was planning to ship out some gibbons. They demanded action from Thai officials. Officials appeared on the scene and told the exporter to drive behind the government vehicle with their gibbons to the Forestry Department office. The smuggler disappeared into the traffic—along with his gibbons. The students kept hundreds of pages of careful logs of the shipments they observed. Around that time, Dr. Colin Groves (a primate expert and long-time member of IPPL’s Advisory Board) was visiting Bangkok. I set up an evening party for him to meet the students. They all brought along their reports, and Colin had individual meetings with each of them, asking about specific things he noticed and giving them all quality time. David Rand came to this meeting, and that is how I first met him. We stayed in touch over the years, and David often supported IPPL’s projects in Asia. His primate stamp collection will always be a wonderful reminder of a dear friend.